A mob of meerkats have made the Walled Garden their home. Meerkats are highly social animals and are members of the mongoose family. They live in large, tight-knit groups called mobs or gangs, and they take turns to do duties such as looking after the young and sentry duty. Meerkats have a long slender body and limbs and they use their tail to balance when standing upright, as well as for signalling. They take 'sentry' duties in turn, this is where they stand 'on guard' keeping a look out for predators. They spend a lot of time grooming and playing together which helps keep the family a tight unit. This strong community is one of the main reasons that meerkats survive out in the wild. You can learn more about our meerkats in our keeper talk at 12pm each day. Meerkats are omnivores, meaning they’re not fussy and will eat almost anything including other animals and plants. Our meerkats eat insects (crickets and occasionally mealworms) and a mix of vegetables and special pellets. Their superb digging abilities help them to find insects hidden in the sand. In the wild, slender tailed meerkats are found in Africa, mainly South Africa, Southern Botswana, Namibia and Angola. Meerkats can usually be found in tropical grassland, desert and semi-desert. The slender-tailed meerkat is not currently endangered in the wild. However, recent media attention on meerkats through adverts and films have enticed people to have them as pets but meerkats do not make good pets, so make sure to come and visit our mob at Wild Place Project instead. You can learn more about the meerkats' conservation status on the IUCN Red List of Threatened Species website. Meerkats are perfect diggers, and we've added a sand pit and a look out post to the Walled Garden so your little ones can dig in the sand pit and stand on duty just like a meerkat. The Walled Garden is also a perfect picnic spot. 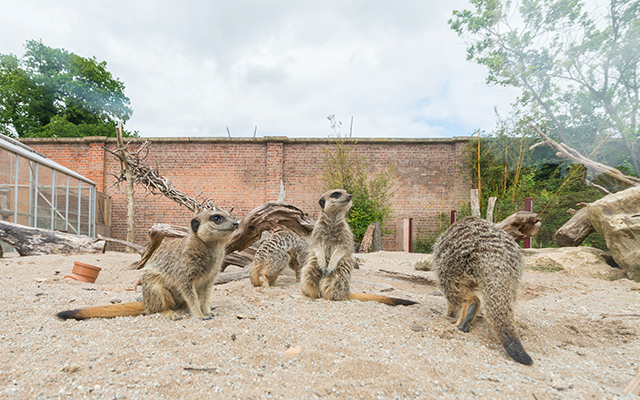 Did you know that you can get up-close to our meerkats in their very own animal experience? Find out more here.